Cardinal Scale’s ARMOR Portable Digital Truck Scales can be moved to multiple locations for changing job sites. Cardinal Scale’s ARMOR Portable Digital Truck Scales can be moved to multiple locations for changing job sites. Their modular design with expandable bulkheads allow you to vary platform sizes depending on weighing needs. The ARMOR Portable features IP69K-rated waterproof digital SmartCell load cells, capacities up to 135 tons, heavy-weight 50-ton CLC, 5/16-inch-thick checkered steel deck, anti-corrosion baked-on tan powder paint, top-side access to all electronics, and NTEP and Measurement Canada approval. The ARMOR® Portable Truck Scales feature an extremely low 18-inch profile, and the versatile design allows for easy set-up for changing environments. The scale may be set on compacted ground surfaces or concrete piers. The floating center module makes it easy to add or remove sections to fit application requirements. The clearance gap below the lower frame allows for easy washout cleaning. Set up is fast and easy, because there are no junction boxes used in the scale and the digital load cells plug and play with each other and provide digital diagnostics for each individual load cell at the indicator. The state-of-the-art, debris-inhibiting load cell stand design limits obstructions to the scale’s performance with the digital load cells mounted high within the stand near the scale deck. The load cell stands are fabricated from one-inch-thick steel to minimize rust and corrosion damage and ensure long-term strength and durability. The long-lasting baked-on tan powder coat paint finish ensures a lifetime of trouble-free protection. The Cloud-based iSite remote monitoring software offers e-mail and/or text alerts to ensure your scale is performing during peak operations. The NTEP legal-for-trade ARMOR® series arrives fully prepared for quick installation with load cell stands pre-installed. 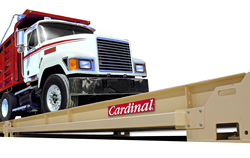 Cardinal Scale’s unique axis® frictionless centering system provides gravity-driven dynamic centering to restrain deck movement and vibration. Each ARMOR® weighbridge features interconnecting load blocks and receivers for efficient, no-bolt installation. Enhanced rodent protection is standard throughout the truck scale using braided wiring and conduit integral throughout each scale module. Every ARMOR® truck scale is 100% assembled, pre-calibrated, and tested before shipping.